Be THE Superstar at any rodeo. Unique center crystal mesh design belts in Black, brown, blue, or Pink. 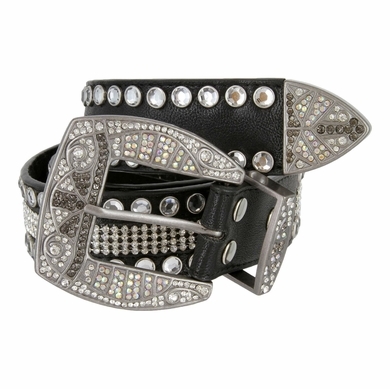 Blinged-out Matching 3 piece buckle sets with an artistic design. Size available: Small/Medium = 33" to 35" and Medium/Large = 37" to 39". Sizing: Measure around where you wear the belt, with your pants on, and order that size.